Download the app now from Google Play. Please check our current Device Compatibility Page. If your device is not currently verified for compatibility you can join our Alpha group to get access for your device. Which devices are compatible with Kevo? Kevo supports iPhone 4S and later models. It also works with iPad mini, iPad Air, iPad2 and later. With the release of Android Lollipop, Kevo supports devices with Android Lollipop compatibility that fully support Bluetooth Smart, including HTC One M9, Nexus 6, Samsung Galaxy S5 / S6, and Samsung Galaxy Note 4 / Note 4 Edge. If your device is not listed as currently compatible, join our Alpha group and we will tell you when your device becomes supported. Is Kevo compatible with Android devices? The release of Android Lollipop has equipped many new Android devices with the new operating system including full support for Bluetooth Smart, both central and peripheral roles. As of November 7th, Kwikset Kevo powered by UniKey affords Touch-to-Open® functionality through an app for Android Lollipop users with Bluetooth Smart and Peripheral role support. Only devices operating Android Lollipop with full Bluetooth support will be able to access Kevo for Android. To find out why Kevo requires Bluetooth Smart Peripheral role find out here. Kwikset and UniKey chose Bluetooth Smart over NFC to be able to provide Kevo users with a hands free, touch-to-open experience, where the smart phone stays in a pocket or purse. Which devices are compatible with Android Lollipop? Android Lollipop is rolling out to different devices through different carriers. 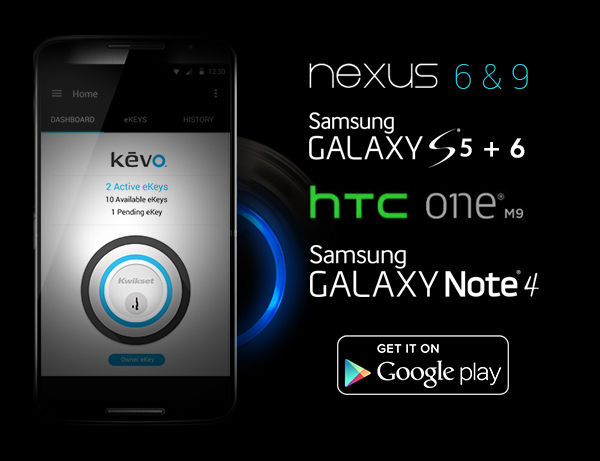 We are monitoring announcements from carriers but at this time only the Nexus 6, the Nexus 9, and the Samsung Galaxy S5 devices will be compatible with Android Lollipop with full Bluetooth Smart and therefore compatible with the Kevo Android app. What if I don’t have a compatible device? Go right ahead and join our Alpha group. 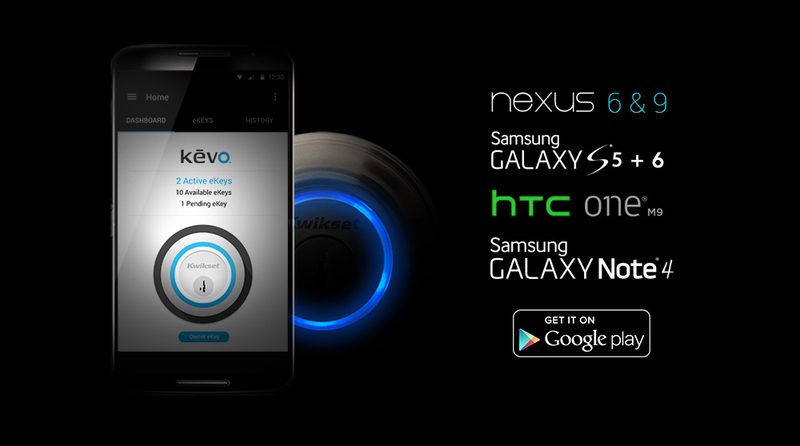 We will notify you when the Kevo App for your registered Android device becomes available. © 2015 Spectrum Brands, Inc. Thank you for agreeing to take part in our beta program. We are working hard to improve Kevo’s lock software and mobile apps, and it is important for us to get feedback through this process to ensure that we are heading in the right direction. As part of this Beta Test Agreement (the "Agreement") UniKey Technologies, Inc. ("UniKey", "we" or "us") will be giving you limited access to non-public development areas of the Product (as defined below) or other software or services and asking for your comments, opinions and suggestions; if you have thoughts on where we can improve, we would love to hear that as well. "Beta Materials" means the non-public development mobile application, firmware, software, services, website, wire-frames, mock ups, prototypes, business plans, or other prospective products or offerings which you may be granted access to as a part of this Agreement. "Product" means any hardware, website, mobile application or other online or mobile product or service of UniKey Technologies, Inc.
"Feedback" means any comments, suggestions, improvements, modifications, alterations, testimonials, or other feedback made or proposed by you under this Agreement. "Beta Test Period" means the period commencing the date upon which you gain access to the Beta Materials and continuing in effect for so long as you have access to those Beta Materials. UniKey Technologies, Inc. is granting you a non-exclusive, non-transferrable license to access the Beta Materials during the Beta Test Period, solely for non-commercial testing and evaluation purposes. UniKey retains all rights, title and interest in the Beta Materials, including without limitation all intellectual property rights embodied therein. You shall not acquire any rights, express or implied through this Agreement other than those expressly specified herein. The term of this Agreement will commence upon your execution of the Agreement and will automatically terminate at the expiration of the Beta Test Period. Either party may terminate this agreement for any reason upon written notice to the other party. Upon termination of this Agreement, you shall immediately cease use of the Beta Materials. We may incorporate your Feedback into the Product. To allow us to do that, you hereby assign to UniKey your right, title and interest (including, without limitation, all patent rights, design rights, copyrights and trade secrets) in any Feedback which you may propose or make during the Beta Test Period or which you and we may jointly make during the Beta Test Period, notwithstanding Section V of this Agreement. However, you also acknowledge that UniKey may end up not using or incorporating your Feedback and that we are not required to do so. You agree not to provide any Feedback that you have reason to believe is subject to any trademark, patent, copyright, or other intellectual property claim or right of any third party. UniKey may publish your name in conjunction with the facts, contents, and outcome of your Feedback, as well as your comments, in testimonials or blog posts or other publications through the Product. By participating in this program, you grant us the right to do so. Tester understands that the Beta Materials may have errors, may produce unexpected results, and its accuracy and reliability are not guaranteed. Tester shall not rely exclusively on the Beta Materials for any reason. Tester agrees that any use of the beta version of the Product, whether as part of this beta test or otherwise, will be entirely at Tester's own risk, and UniKey makes no representations concerning the completeness, accuracy, or operation of the Beta Materials. Tester agrees that it is Tester's sole responsibility to have a backup key or other method of entry and to take the appropriate measures to protect Tester’s property. Beta Materials are prerelease and are not at the level of performance or compatibility of a final, generally available product offering. Beta Materials may not operate correctly and may be substantially modified prior to first commercial shipment, or withdrawn. Beta Materials are provided "AS IS" without warranty of any kind. The entire risk arising out of the use or performance of Product remains with Tester. In no event shall UniKey be liable for any damage whatsoever arising out of the use of or inability to use Beta Materials, even if UniKey has been advised of the possibility of such damages. UniKey shall not be responsible for any loss or damage to Tester or any third parties caused by Beta Materials. UNIKEY SHALL NOT BE LIABLE FOR ANY DIRECT, INDIRECT, SPECIAL, INCIDENTAL OR CONSEQUENTIAL DAMAGE, WHETHER BASED ON CONTRACT OR TORT OR ANY OTHER LEGAL THEORY, ARISING OUT OF ANY USE OF THE PRODUCT OR ANY PERFORMANCE OF THIS AGREEMENT. Failure or delay by either party to exercise any of its rights under this Agreement shall not constitute a waiver of those rights. If any provisions of this Agreement are held by a court of competent jurisdiction to be invalid under any applicable statute or rule of law, they are to that extent to be deemed omitted and the remaining provisions of this Agreement shall remain in full force and effect. This agreement constitutes the entire agreement between both parties concerning this user interview process and supersedes all previous communications, representations, or understandings between the parties, whether written or verbal. Any amendments to this Agreement must be made in writing and signed by both parties. This Agreement shall be governed, construed, and enforced in accordance with the laws of the State of California, without regard to its conflict of laws rules. Any dispute arising from this Agreement shall be heard in a court of competent jurisdiction in the State of California. This Agreement shall bind and inure to the benefit of the successors and assigns of the parties.